Highly aromatic, with notes of peach, nectarine, orange, and dark caramel, this coffee delivers all around. Full bodied, round, coating, and clean textures allow the flavors to shine without distractions. In the acidity, cara cara orange, peach, pear, and nectarine glow on the palate without overwhelming. Dynamically sweet, this coffee delivers fresh fruit nectar and rich caramel in copious amounts. Almost no bitterness is present, but complex cola, grains, and tannins show themselves, and calm down into a long lingering smooth chocolate fudge. An impressive cup profile. Categories: Coffee Ratings. Origins: Kenya. Flavors: Caramel, Chocolate fudge, Fruit Nectar, Nectarine, Orange, Peach, and Pear. Brew Descriptors: Balanced, Clean, and Sweet. 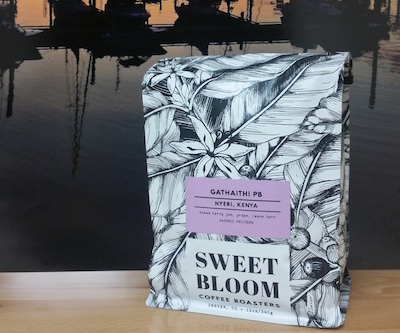 Roasters: Sweet Bloom Coffee.